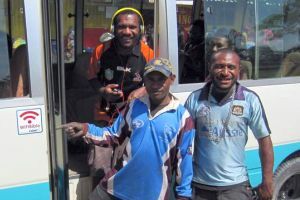 PNG is an oral society and the latest development of the solar pack is important for Christian Radio Missionary Fellowship (CRMF) to distribute resources of its key partners to rural and remote populations. One of CRMF's key partners is GRN. In 2014 or 2015, CRMF received from Christine Platt, an external hard drive of the GRN Audio Library. This was the same year that CRMF was moving toward the initial vision to distribute Christian resources to churches. The content of this GRN audio library played an important role in the CRMF WiFi Bible Content Committee deciding which resources to be included. Currently CRMF is distributing resources in different ways via Mission Aviation Fellowship (MAF) planes, MAF bases, secondary schools, Bible schools, health centres, public buses, pastors' houses, canteens, hotels, bookshops, coffee shops and many more. In most cases it is difficult to get good feedback on the impact of WiFi Bible devices that are installed in these places. However, its impact during live downloads at conventions, youth camps and during training can be seen. Praise God that this Bible content is freely available via the WiFi device. That is why GRN and other key partners who have given permission to distribute their content freely are such a blessing for the Church in PNG. There will always be a need for good content and the content that speaks directly to the heart is the language of a person. GRN will continue to play an important part in giving CRMF resources to distribute via the WiFi device to make an impact in the lives of people. CRMF will continue to praise God for giving the knowledge, skills, vision and the expertise to develop this medium to distribute God's Good News. Its potential to freely distribute without using data over the internet makes it a unique device to be used for God's glory. 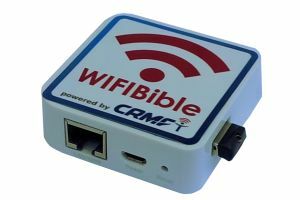 Again it is exciting that the WiFi Bible did not stay in PNG only but is now being used overseas in places like Madagascar, Liberia, Uganda, Tanzania, Timor-Leste and South Sudan. The WiFi Bible is not only a distributing device but it has become an important asset to build relationships, make new contacts, increase networks and more importantly an opportunity for God's Word to be freely available. Praise God for this ministry partnership which has enabled the distribution of GRN resources throughout PNG.